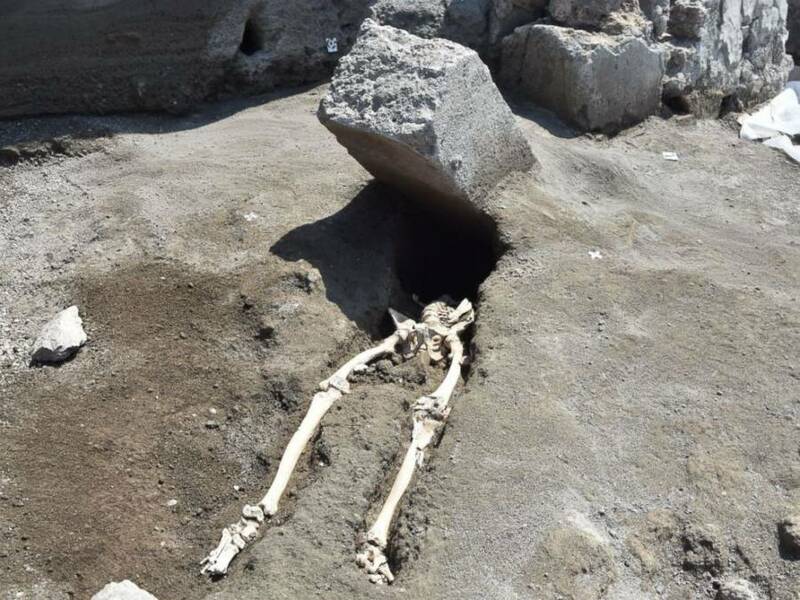 The victim, who was crushed by an enormous stone while trying to escape, is the latest in a series of discoveries at a previously unexcavated Pompeii site. Although the historic eruption of Italy’s Mount Vesuvius and its subsequent destruction of the city of Pompeii happened in 79 A.D., archaeologists are still making new discoveries that reveal the extent of the horrors. 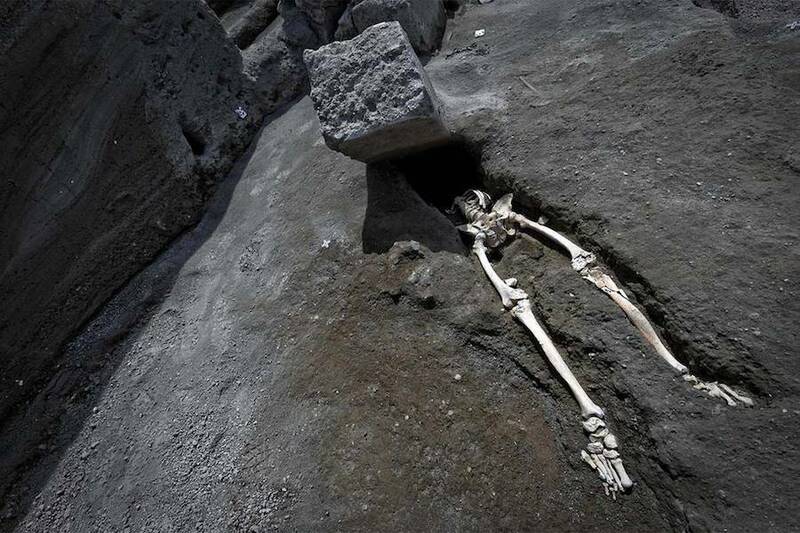 On May 29, archaeologists at the Pompeii excavation site uncovered the skeleton of a man whose head was likely crushed by a massive stone as he was fleeing the eruption, according to CNN. The stone — which weighs more than 650 pounds and could have been a door jamb — seems to have hurtled toward him after being propelled by the force of the gas, lava, and debris expelled from the volcano. 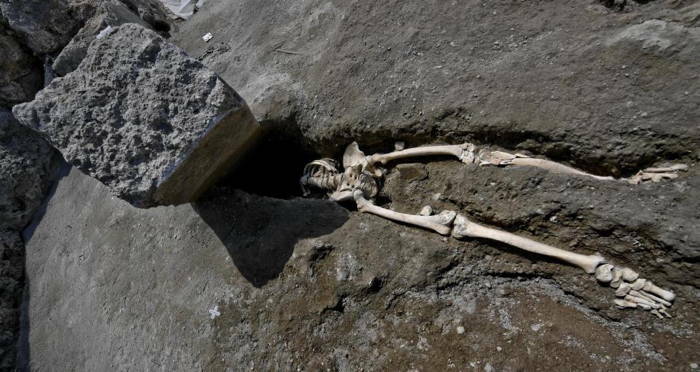 The stone then crushed the man’s thorax and obliterated his head to the point that archaeologists haven’t yet found the skeletal remains of his skull, which may be buried somewhere beneath the enormous stone from which only his body protrudes. Thus far, the remains of the man’s body suggest that he was probably older than 30 and suffered from an infection of the tibia, which may have made it difficult for him to walk and thus hindered his ability to make a quick escape, according to dig site superintendent Massimo Osanna. The man had likely survived the initial stages of the eruption before seeking shelter in a nearby building. It was then, experts say, that an ash cloud threw him backward and the stone landed on his head. This discovery comes after several other exciting finds in a recently-found northeastern area of the excavation site over the past few weeks. New finds include horses who were poised to escape but couldn’t quite make it as well as the complete skeleton of a young child in a bathhouse. The latter marked the first time in around 20 years that a complete skeleton was discovered at Pompeii and the first time the remains of a child were discovered in around half a century. This child and the newly-uncovered man are just two of the scores of victims of Vesuvius, still one of the most dangerous active volcanoes on Earth. When Vesuvius erupted in 79 A.D., it was one of the deadliest disasters of its kind in history with a total death toll that exceeded 10,000 but may never be known for sure. Nevertheless, archaeologists continue to excavate at the site in hopes of learning what exactly happened there thousands of years ago. Next, take a look at these photos of Pompeii’s bodies frozen in time. Then, check out the most facsinating discoveries in the history of archaeology.